Who can resist a giant bird in a green grass skirt? Not the dozens of people who stopped to take a photo with “Hula Herky” at the UI Alumni Association’s Students Today, Alumni Tomorrow (S.T.A.T.) information table during summer orientation. 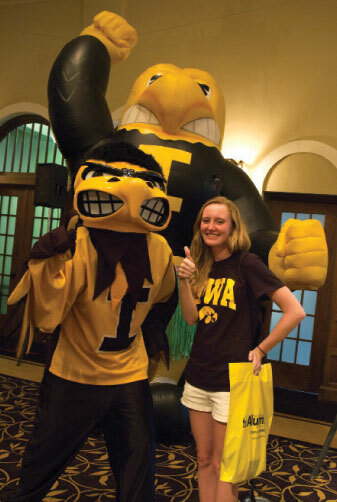 Orientation leaders gathered for a group shot with the giant birdie beach bum, incoming students laughed as they struck the same pose (one fist down, one fist up), and even the live Herky roaming the IMU’s Main Ballroom paused to “say cheese” with his inflatable likeness. Afterward, UIAA staff placed these photos on the S.T.A.T. Facebook fan page, where quite an album began to grow throughout June and July. It proved to be just the kind of draw that UI marketing intern Sam Dolan* had envisioned. She and her team chose a colorful theme to attract attention in the sea of booths, one that would lure freshmen to stop and learn about the organization. Bright banners spelling “Join S.T.A.T.” adorned the table, staff wore Hawaiian leis, and a welcome mat beckoned “Come on in.” Two big bowls of candy didn’t hurt, either. The UI’s summer information fair, which concludes two days of orientation sessions for new students and their families, includes many organizations on campus. S.T.A.T. is one of the UI’s largest student groups, offering benefits such as a discount card to 30 local businesses, a subscription to the S.T.A.T. Underground electronic newsletter, and invitations to free food and other exclusive member events. Fairgoers who presented a special alumni association mailer at the S.T.A.T. booth received a free Tigerhawk decal. For a $20 one-year membership, students received all these perks plus a T-shirt, student ID holder, cling pennant, and coupons to Iowa Book and the Hawk Shop. A special $70, four-year membership was also offered during orientation. Molly Scherer of Naperville, Illinois, mother of incoming business freshman Matthew Scherer, was holding up well at the end of her orientation crash course. After helping Matthew sign up for S.T.A.T., she laughed that she’s now an old pro at sending her children off to college. Her older daughter attends university in Saint Louis. Amanda Crane of Chicago, who plans to major in journalism, feels like she’s already made friends through orientation. Clasping her black-and-gold bag of S.T.A.T. goodies, she said the UIAA’s group will help her feel even more welcome and comfortable during her first year at the University of Iowa.